The reason behind the trial of Batwoman isn't what you think in Detective Comics #975 – AiPT! The Bat Family is in dire straits. The proverbial Bat Family is in dire straits. Much of the group including Batgirl, Nightwing, Jason Todd, Damian and Tim Drake are fine, but Batwoman is in big trouble. Two issues ago Batwoman killed Clayface. She blew his brains out but felt it was necessary to save lives. It’s hard to argue with that, but out today, Detective Comics #975 aims to determine what to do with a vigilante hero who commits murder no matter the reasons. 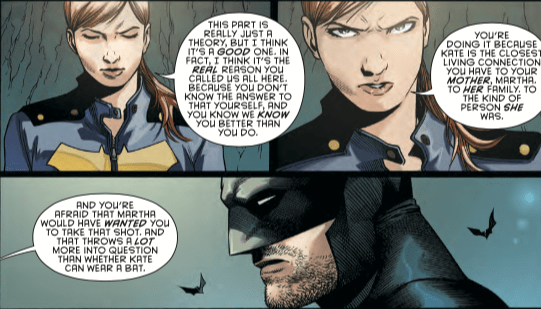 In a key scene late in the issue, Batgirl makes it clear the reason for the trial at all is due to Batman’s conflicted feelings. A question that Batman has asked himself many times before I’m sure. Is writer James Tynion IV asking this question as a way to say Batman can’t argue with Batwoman’s results? Or maybe the team he’s formulated was a way to give Batwoman the chance to prove that statement wrong and not kill? Let us know in the comments what you think. You can buy Detective Comics #975 digitally today. AiPT! Podcast Episode 19: We Love Comics!